What Is My Penny Worth? This is the most common question that I get from running this website. You'd be amazed how many people wind up finding some old penny while digging through their closet or looking through a jar of coins. It's always nice to be able to find out if you've got something special - honestly, in my opinion, all pennies are special! However, it would be great to find a simple place to get the value of a penny. Well, that's why I built this page! Before you can get an estimated*** value of your penny, you need to grade it first. By grading it, I mean you have to evaulate the condition of your coin, as coin values are mostly dependant on their condition. What follows is a rough guide to grading pennies that you can use. At the bottom of the guide is a form you can use to find out the value of your penny! *** - The values provided by this website are for entertainment purposes ONLY. They are not a guarantee of the value of your coins. The values used here are from the 2006 edition of J.A. Haxby and R.C. Wiley "Coins of Canada - 24th Edition". The value of pennies does not vary much, so the 2006 values are likely representative of what a numismaticist might evaluate your coin's worth - assuming their grading and yours are the same. Your mileage may vary. NO WARRANTY provided with this information! About Uncirculated-50 (AU-50): There are barely signs of wear on nearly all the highest areas. 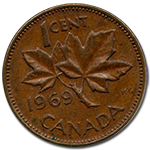 Much of the original shine (lustre) of the coin is still present. There may be some minor bang marks as the coin contacted other coins in the bag - but no major blemishes. Extremely Fine-40 (EF-40): Shows just slight wear, but more than AU-50. Overall the coin is very sharp and traces of the original mint lustre may still be showing. Very Fine-20 (VF-20): The same as EF-40, but with moderate wear on the high areas. Fine-12 (F-12): Moderate to considerable wear evenly across the coin. The entire design is still bold. All of the lettering is still visible. Very Good-8 (VG-8): This is a well worn coin. Most of the fine details of the hair and leaves are worn nearly smooth. Good-4 (G-4): Heavily worn, but major design remains visible, although faint in some areas. Some features may still be descernable in outline form without central details. About Good-3 (AG-3): This is a very heavily worn coin. Some of the lettering, date and artwork has been worn smooth. The date is barely readable. You may notice that some pennies tend to tarnish and change colour over time. Although this will play a role in a numismaticist's evaluation of the coin, for our purposes it can be ignored. Personally, I prefer a penny that has taken on a rich, chocolate brown tarish. It makes the coin look well travelled to me! Try to examine the coin in a well-lit area, and if possible, use a 4x to 8x magnifying glass to examine the coin's surface. If possible, search for an image of what the coin's design should look like so you can evaluate how much has worn off. Rarer dates or issues of coins are graded no differently - even among coins of the same year (ie: 1953). Expect larger pennies to have more bang marks on them than smaller pennies. The higher the grade of a coin, the longer it should take you to arrive at that conclusion! Heavily toned coins must be studied more closely to reveal any blemishes that are being obscured. Grading circulated coins involves looking at just the coin's wear. Grading uncirculated coins brings in other factors such as lustre, surfaces and strike. It is natural for the owner of a coin to give it a higher grading, and for a purchaser to give it a lower grade. A coin can only be priced once it is properly graded. On the other hand, you cannot determine a coin's grade based on it's price. Grading is not an exact science - it is very subjective and relies on human judgement! Do not grade by "eye appeal" (in other words, assigning a high grade because the coin looks nice and shiny). The true grade is in the details! That's it! If you've read this far, you are ready to find out what your coin is worth! Use the form below and find out now!